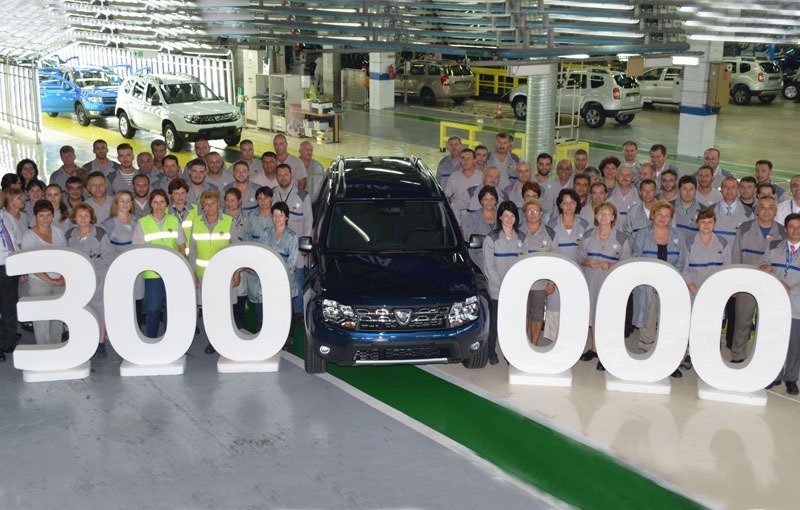 After celebrating the production of the 500,000th 0.9 TCe engine in Mioveni, Dacia announces the production of the 300,000th Duster facelift unit at its factory in Romania. Dacia Duster facelift, the restyled version of the first Romanian SUV, celebrates the production of 300,000 units in Romania. The anniversary unit was produced after two years from its launch, and shortly before the launch of the new updated version. The Romanian car manufacturer has announced a new version of Duster with interior and exterior aesthetic updates, that will be presented at the Motor Show in Frankfurt this month. Until then, the production of Duster continues at the factory in Romania, which operates at maximum capacity. Currently, the production of Duster covers more than 50% of the production capacity of the Dacia factory in Romania. The 300,000th Duster facelift unit is a 4×4 with an 1.5 dCi engine with 110 HP with Blue Cosmos color and Laureate equipment, and is going to a client in Italy. In Romania, a 4×4 Duster facelift powered by a 1.5 dCi engine has a starting price of 17,100 Euro with all taxes included. Even five years after its launch, the Duster has not yet a rival in the true sense of the word, being both the most affordable SUV in its class on the market and the most capable model in this class when it comes to off- road capabilities. “This round figure marks the commercial success of Duster two years after the launch of phase II. At the same time, the success of the work of Dacia and Renault Technologies Romania teams, who have the ambition to meet the most demanding automotive markets in the world offering an attractive and agile car, with better quality and reliability. Like all employees of Renault Romania, I am very proud to produce this beautiful car in Mioveni, in Romania, “said the Dacia Vehicles manager, Cornel Olendraru.